“If you don’t eat enough leafy vegetables and greens, you will become weak and tired. There won’t be enough blood, and you will look pale and anaemic,” is something we have grown up hearing right from our childhood. Be it mom, be it grandma, they have always painted a very green and leafy picture of iron! There is no doubt that green leafy veggies, especially spinach, are a great source of iron, but there is much more to it. Cereals like ragi and bajra, dals and pulses, nuts like walnuts and almonds, and oil seeds like garden cress seeds and sesame seeds, are fantastic sources of iron too. Refer to our complete list of 35 Iron Rich Foods. Cooked in interesting ways, these provide variety and many a tasty means to building our iron stores and raise our haemoglobin levels like having the Jowar Methi Roti, which in turn will ensure a good blood supply to all the cells in our body, and make us energetic enough to face our daily hassles. We have a collection of Iron rich Rotis and Parathas. This section will help you improve the iron content in your diet through mouth-watering recipes like Chawli beans and Mint Burger, which are also easy to prepare and made with readily available ingredients like the Beans and Amaranth Leaves Dal, so that you can make them often without much ado. Make lots of healthy iron Sabzis and Dals along with rice and pulao. Top up your daily iron requirements with breakfast and healthy juices. These recipes have been prepared by our team of chefs and nutritionists after thorough research and planning, and are suitable for healthy people seeking to boost iron and haemoglobin levels, as well as those who have a bit of an iron shortfall to overcome. Tarla Dalal Hi, Thank you for your kind words. Do try the recipes and let us know how you enjoyed it..Happy Cooking !! 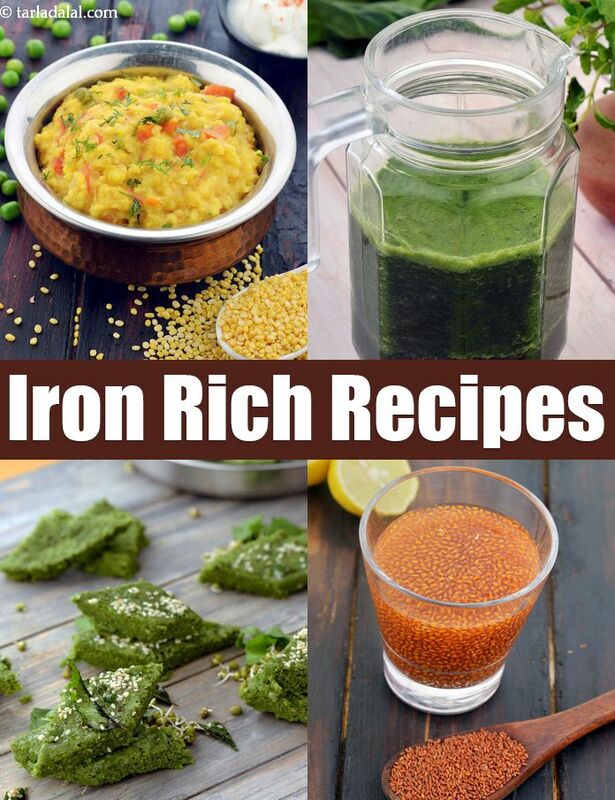 I was looking for Vegetarian Iron rich recipes and came across your lovely collection of recipes. Just what i needed. Started including Palak Chana Dal and Palak Paneer in my diet regularly. Tarla Dalal Seema, thanks for the feedback.